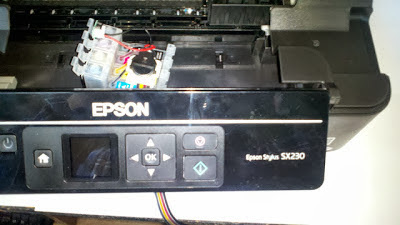 Here you see a method as installing the ink system Epson Stylus SX230, follow the steps and if you have any other questions, type a comment. We have seen before how to install a printer such, it is the Epson Stylus SX130, now the facility to a more complex but easier to adapt a continuous ink system equipment. As you know we need to get a continuous ink system, one that guarantees the good operation and has the flexibility hoses, please ask to check the operation of the battery to reset. Remember most of all, get quality inks compatible with Epson printers, it is very important to get ink for Epson, others may damage the printer in a way that can not repair more. You may be interested in our publication which are the components of an ink system, although the cartridges and the battery does not appear, Epson printers need to reset when the cartridges can not be recognized. 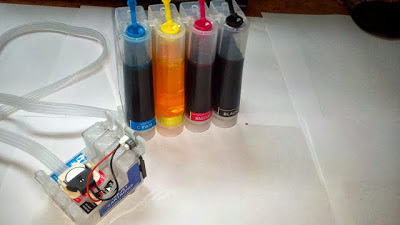 Should put the corresponding color ink cartridge with ink tanks, you can assist you even more if you buy an ink system which has the colors on the tank and cartridge system. After we fill the tanks of the system, the next step will bring the ink cartridge, this will be achieved with a syringe and providing some air from the above cartridges. 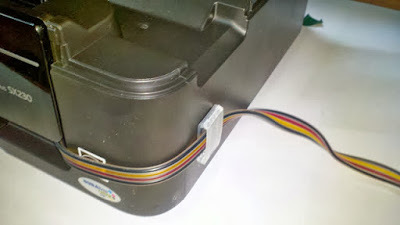 Then insert the cartridge from the front of the printer must have the printer off electrical power cord, this will give us the ability to move the printheads. 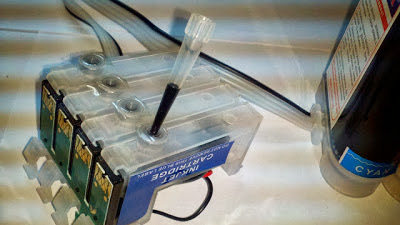 Then put the cartridges in the injectors, it is recommended to do so when the carriage is positioned right on the spot that the ink cartridges are replaced. So that the hoses do not produce jams head, place what hold the head at the top through which the head from side to side, use a strong glue that remains long running. 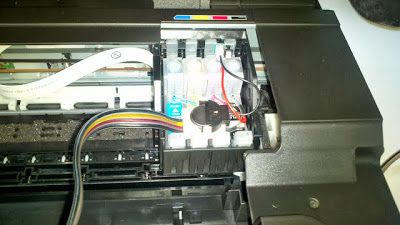 Finally place the system hoses on the outside of the printer, hold a piece having the ink system, look at the image below. If you have another method of installing or question, just write a comment in the post, will gladly help you.